This is in response to your letter of December 4, 1989, to the Occupational Safety and Health Administration (OSHA) regarding the requirement of chemical manufacturers to provide material safety data sheets (MSDS) under the Hazard Communication Standard (HCS), 29 CFR 1910.1200. In your letter, you correctly summarized OSHA's requirement regarding the provision of MSDS for consumer products. OSHA does not require that MSDS be provided to purchasers of household consumer products when the products are used in the workplace in the same manner that a consumer would use them, i.e. ; where the duration and frequency of use (and therefore exposure) is not greater than what the typical consumer would experience. This exemption in OSHA's regulation is based, however, not upon the chemical manufacturer's intended use of his product, but upon how it actually is used in the workplace. Employees who are required to work with hazardous chemicals in a manner that results in a duration and frequency of exposure greater than what a normal consumer would experience have a right to know about the properties of those hazardous chemicals. In your letter, you describe a situation that occurs in some institutional settings where employees use your client's "household products" (pesticides) in a manner different than how a homeowner would use them. Regarding this type of situation, you stated ". .my client does not intend that its products be used except as a consumer would use the product. Should an institutional customer contact my client regarding the need for a MSDS for a particular product, where the customer intends to use the product in a manner dissimilar to that in which a homeowner would use the same product, my client intends to inform the customer that such use is not appropriate and to decline to provide the customer with a MSDS for the product." Such action on the part of your client would constitute a violation of OSHA's HCS which requires "all employers to provide information to their employees about the hazardous chemicals to which they are exposed by means of a hazard communication program, labels and other forms of warning, material safety data sheets, and information and training." (See 1910.1200(b)(1)). Furthermore, section (g)(7) requires retail distributors that sell hazardous chemicals to commercial customers to provide MSDS to such employees upon request. (Distributors obtain the MSDS, of course, from the chemical manufacturer, the preparer of the MSDS.) 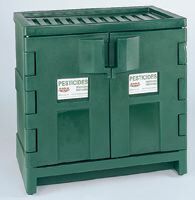 Additionally, the chemical manufacturer of the pesticide (your client, in the situation you portray), would have to have developed and have available at his manufacturing worksite location, MSDS for his own employees at that site who are exposed to the pesticide(s) in question during their formulation and production. Sharing the MSDS with downstream employers upon request for distribution to their employees who are also exposed meets the intent of the standard. I hope this has been responsive to your concern. Please feel free to contact me again if you have any further questions.